Whenever we want to shift our goods from one location to another first thing come in our mind is what are Packers and Movers charges? How much does it cost to shift house or office goods? All of us want to Know packers and movers price to set our budget. It is very important to keep yourself up to date with the information spread around you. No matter what topic is related to it. Packers and movers in Delhi play an important role in our lives because they help us in moving us to a place where our dreams will come true. It is necessary to know the latest packers and movers charges in advance as this can save you from hidden shifting price introduced by different movers and packers as a scam. 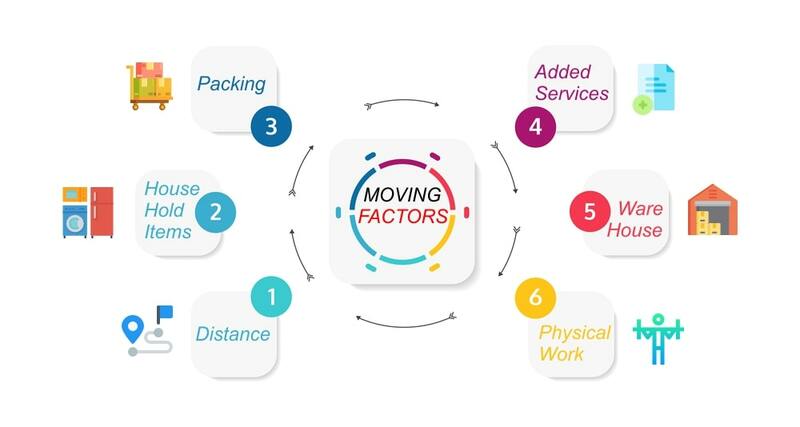 Here we will tell you about the latest movers and packers charges rate list, what factors affect moving cost, how to calculate exact packers and movers cost per Km. and how you can reduce moving expenses. Movers and Packers price vary from one city to another city because of the living standard of each city is different. Our experts came with the latest estimated rate list for house shifting after comparing thousands of top packers and movers companies’ price. You can consider it as a standard rate list to decide your moving budget and analyze which packers and movers suited your shifting requirements the most. Please take a note that this is an approximate rate list which may or may be 100% fit according to your city. Continue reading blog to know the latest movers and packers price. After studying packers and movers Delhi price, it can be said that there are few factors that influence the packers and movers cost. Below listed points are the factors that you need to know whenever you hire a verified and trusted packers and movers company with affordable price rate list. If we talk about the approximate price of household goods organizing, loading and unloading then this will come across Rs 1500-4000 depending upon the quantity of goods you have. Distance matters a lot when you are thinking of shifting your household goods on time safely to the destination you want. There is no approximation as this is a variable factor that influence the Packers and Movers charges. However, it can be assumed that if you have less goods and you want to shift your goods to a place near to your current house then ***packers and movers price*** is less as compared to the price charged for a long distance shifting. So, it can be said that the charges per km varies from companies to companies. For packing standard number of household items including bed, cooler, tv, chairs, fridge, fan, washing machine, almirah and other delicate items that is easy to find in a normal Indian house, the standard approximate price would be Rs 2500-9000 rupees for packing of goods. Manpower also varies places to places and house to house. If you want to move household goods of 1BHK where two people are living then approximate packers and movers Delhi price will be Rs 1000-1200. For 2BHK where 4 people are living then approximate packers and movers price will be Rs 1600-2200. For 3BHK where 5 people are living then approximate movers and packers rate will be Rs 2000-2800. Please take a note that these are the standard charges for house shifting. Again, this is a variable and it totally depends on the quantity of goods you have. It also depends on the packer and mover Company you have chosen for your moving needs. Delhi has its own road rules where heavy vehicle have their own timings to run on Delhi roads otherwise challan will be done. You and your chosen packers and movers should be aware of these road rules. Price will vary depending on the level of shifting you are doing i.e. local, domestic or international. You must choose a reliable packers and movers Company who provide insurance facility along with their relocation services. If a moving company provides insurance facility along with their service, it proves that they are genuine and government recognized. Good news is that the price of insurance is fixed which 3% on the declared good’s value. There is a standard percentage of the additional expenses that you have to add in your moving budget so that you are prepared for any expense that may rise during the relocation. It is 20% approx. of the total packers and movers expense or bill. Usually it is 5% of the total moving expense depending on the level of moving you have. Taxes including GST, toll and octrai charges (if any). Generally, it is 15% of the total moving expense depending on the quantity of goods and the type of vehicle used in transportation in local shifting and for domestic shifting, the cost can go greater than 50% of the total shifting cost. Sometimes, when the packers and movers are not able to shift your household items to the place you want because of the time you choose to shift then you might need storage renting as well. So, it is good to hire Packers and Movers in Delhi with affordable charges who has storage renting facility as well and that too owned by them and not by third party. Generally, it is Rs 100-400 per day. The packers and movers charges is estimated after evaluating more than thousands of moving quotes from the moving companies across India. The standard rates of packers and movers for local house shifting starts from Rs 3000 and can go upto a maximum of 20500 rupees Approx. depending on the volume of goods. For local office shifting price starts from Rs 6500 and can go upto Rs 35000 depending upon the volume of goods. Figures stated below in table will give you a fair idea about the packers and movers rate list for local shifting. The cost of movers and packers for domestic shifting is also estimated after evaluating more than thousands of moving quotes from the moving companies. For domestic house shifting, the standard movers and packers rates start from 7000 rupees and it can go upto Rs 45000 approx. and that too depends on the volume of household goods. Additional charges may apply according to your shifting requirement. For office shifting, the standard rates of movers and packers for office relocation start from 15000 rupees and can go up to Rs 58000 approx. depending on the volume of goods. Figures stated below in table will give you a fair idea about the packers and movers price list for domestic shifting. How to estimate Packers and Movers Charges per km? The number one factor that affect the movers and packers charges per km is the type of vehicle used for the transportation of goods to the destination. Imagine that your belongings are less in number but you hired a long big truck to transport your goods. Does this make sense? Will this save your moving cost per km? Obviously not. That is why it is always advised to get help of best packers and movers Delhi to relocate your precious belongings. Ujjawal National Packers and Movers uses advance moving strategy to relocate the belongings which are close to your heart just to make sure your goods are shifted safely and on-time. Ujjawal packers movers intelligently packs your good so that they consume less space and all your packed goods can fill most of the space conveniently. If you choose shared transportation vehicle to transport your belongings over a separate one then obviously movers and Packers charges per km will be less. However, you should decide according to your comfort whether you want a shared vehicle for transportation or a separate vehicle. Ujjawal national packers and movers provides both vehicle facility to save the cost on transportation charges per km. Our moving strategist will help you in deciding whether you should go for a separate vehicle or shared vehicle. No matter what kind of transportation you choose, our reliable transportation team will take care of your goods and provide end to end moving support in transporting the goods safely. How to get exact cost of moving? To get the exact and accurate cost of house shifting, contact Ujjawal National packers and movers for house shifting charges rate list. Our most promising relocation services are available at affordable rates. This is what Delhi people used to say about our relocation services when they hired us to move their belongings to their new home. Their priceless ratings and reviews make us one of the ***best packers and movers in Delhi***. We build long term business-client relationship with our clients by delivering them unmatched high-quality house shifting services at affordable rates they cannot deny. Feel free to contact on our 24/7 customer support number 09899466123 anytime to get free quote and know the accurate cost of moving and house shifting charges/cost. How you can save moving cost with Ujjawal packers and movers? Our advanced shifting strategy is what makes the relocation a wonderful experience since everything is pre-planned and is executed accordingly. Our advanced shifting strategies are time saving and cost saving which makes us the best option to be chosen for house shifting services in Delhi at affordable price.